The first step you have to do after you brought and opened Xperia V package is trying to assemble the SIM, the battery and memory card (optional). 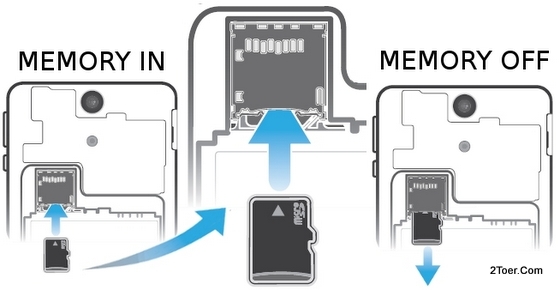 To do that you have to open the back cover casing because the micro SIM card tray (holder) and microSD external memory card slot is covered with back cover casing. 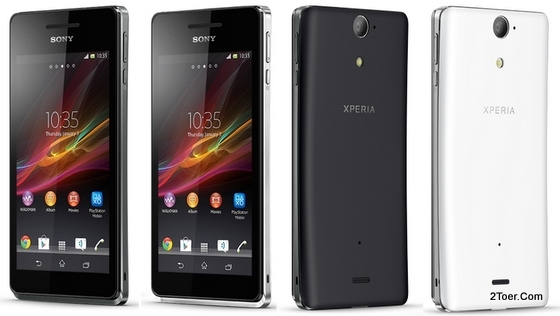 Hold with your left hand the Xperia V and make sure the rear body is facing your eyes. With the tip of your finger (right hand), grip the latch (tiny gap for opening is provided on the bottom side), gently press and the pull the cover up until the bottom part of cover opened. Then you can resume on opening the cover from side to side until the cover fully removed (detach). 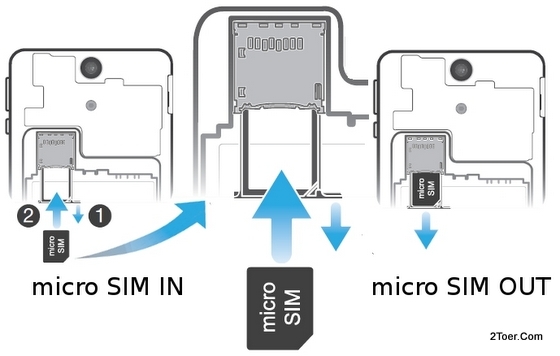 The SIM card slot with its micro SIM card holder place in the same location but it designed like two floors of building (house, etc). The micro SIM card slot and holder is on the bottom, and the upper side (top side) is for microSD memory Card's slot. Slide out the microSIM card holder from the its slot with your fingernail then put / place the microSIM into the holder with gold-contacts facing down and the cutting edge on the right bottom side (see the figure above). After the microSIM is placed and align properly inside the SIM holder, you can push it back to the Card slot until it firmly inserted (reach and of slot). To remove the SIM card, you can the opposite. Just pull out the microSIM holder from the slot, and then remove the microSIM card from the holder (it might be a little tricky, you can use your fingernail to do this). You don't need to follow the tutorial below if you don't want to have additional storage, or you down own the microSD card. For inserting the microSD memory card all you need to do just directly align the microSD card in to its slot the push it to the slot until it reach the end of the slot and locked. Make sure the gold-colored contact facing down and it align in proper position (shown on the picture above). To remove the microSD just pull out the card with your finger, there is a small part that the card still can be held with your hand or tip of finger or finger nail, then draw it or slide it out. Done. 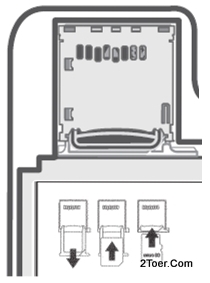 For Your Information, there is a carved image tutorial below the SIM and memory slot on the "floor" of battery's compartment If you forgot what you should do on inserting the SIM and memory, you can get the help by referring this carved image. 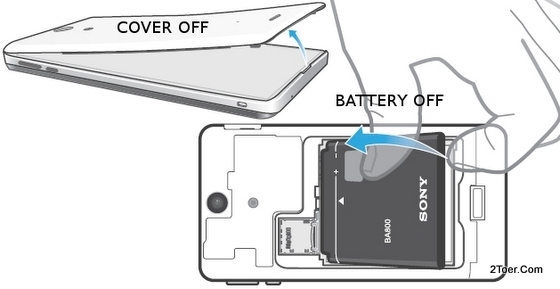 If you had already inserted the microSIM card and microSD card into the Sony Xperia V, now you just need to assemble back the battery and covered back the back cover casing. Assemble the battery should be no kind of problem. Just align the battery with the its compartment, make sure the connector (silver / gold) are aligned with each other properly then starting from the top you can inserted to the compartment, then press it down if it's needed. Make sure the label facing down or the "SONY" letter on the top side. Now it time to replace the cover back. Align the cover in position with the rear side body of the Xperia V LT25i, then press it down from side to side until it attached tightly. You may hear a "clack" sound when you doing this. There are two ways on getting the battery of this phone can be charged. Both of them using the USB cable. The first: Connect the USB with microUSB side to the phone's charger jack then connect the USB to the Computer PC or Laptop. Beside it will be charging the Xperia V's battery, you can also make a USB connection and do some several task: transferring music, connect to PC companion, save the contact to your phone or PC, transferring videos and document and else. The second: with the microUSB side jacked into the phone, you can connect the USB cable into Adapter, and then plug the Adapter to Power Electricity Source. Note: There is an LED indicator of charged, charging, o battery low, but remember that it wouldn't immediately light up when you connect into the charger; wait for 1-2 minutes before you able to see the LED light. Green light means you need to unplug the USB charger because the battery is fully charged, Flashing RED light means the battery need to be charged immediately because it's in low condition, and Orange means the battery is being charged. On Factory Data Reset. This action might don't need to be done if you just used the phone for a while, but in case there is a big problem in the future usage of the phone such as the 4.3 inches TFT capacitive touchscreen stop responding aka freeze, the 8MP rear camera don't respond or can't be used, you try this final problem solver for your XPeria V LT25i. To do Hard Reset just go to Home Screen > Tap apps > Find and Tap Settings > Backup & reset > Factory data reset > Reset phone > Erase everything > Wait till the process of Resetting your phone back to original factory default setting is done. Remember that by doing this factory reset, you will lose all you saved data, including photos, videos, games and applications. Make sure you already have a back up if you don't wanna all this data are deleted.